Less Fertilizer + Less Water = "GREENER" grass for the environment and more $ in your pocket! Paspalum is the ultimate choice for water savings, so if you are looking to find that "perfect grass," paspalum could be right for you! It has a short winter dormancy period, so if you decide to forgo overseeding, you won't have a brown lawn for long. You can also paint your lawn with our Endurant Turf Colorant if you decide you do want that beautiful green all winter. Paspalum is a full sun grass and should not be used in shade. 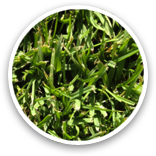 Care for your paspalum lawn is different than that for other warm and cool season grasses, so please review our special Paspalum Maintenance Tips page. Our newest sod--Less Fertilizer + Less Water = "GREENER" grass for the environment and more $ in your pocket!